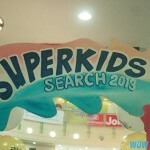 Another entertaining event was held last September 22 at Robinson’s Place Lipa Activity area where seventeen dazzling little kids competed for Robinson’s SUPERKIDS Search 2013. Before this competition, workshops took place to hone kids’ dancing skills, modelling skills and vocal power last Sept. 14-15, 2013 which aims to enhance the skills and confidence on stage of the superkids. The competition started with seventeen cute kids dressed in their superhero costume ramp on stage to introduce themselves. We saw little wonderwomen, Darna, Batgirl and even our very own Juan De La Cruz joined the competition. The crowd’s cheering their bets even when the kids show their moves on stage during their production number. Right after the introduction, they already showcased their talents with some of them danced, sang and drew. Glowing with them are their supportive parents who we saw uplifting their kids as they perform. It was indeed a touching moment to see parents supporting their kids on this wonderful event. Winners received the following cash prizes: P3000 for the 3rd placer, P5000 for the 2nd placer and P7000 for the Robinson’s Superkid 2013, with all of them receiving a certificate and trophy. Congratulations kids! You were all winners and did shine that day. Robinsons Place Lipa Invites You to Their April 2013 Events!